Preventable dog disease claiming too many lives, and it's something more dog owners should be concerned about than ever before, according to experts. 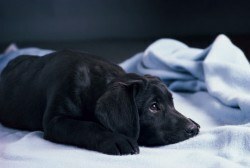 Vets from the UK’s leading veterinary charity, PDSA, are warning that the deadly dog infection parvovirus is present and dangerous in Britain. Canine parvovirus (CPV) is a highly infectious disease that can lead to death. It mainly affects younger dogs and in advanced stages, can kill nine out of ten animals. Some dogs can survive the infection with intensive veterinary and nursing care. But with over 25 per cent of cases proving fatal, animal welfare organisations are urging all dog owners to vaccinate their pets to prevent them from contracting the disease and risking death. PDSA Senior Veterinary Surgeon Sean Wensley said: “Parvovirus makes dogs extremely ill which is distressing for both them and their owners. PDSA staff at some PetAid hospitals have seen a large influx of very sick pets over the past few weeks. The virus normally affects a dog’s intestines, causing signs such as vomiting and diarrhoea. The faeces will also often contain mucus or blood. Dogs with parvovirus can also become subdued and lethargic very quickly, and go off their food. If a dog develops any of these signs, they should receive immediate veterinary attention. Some dogs will recover but others can die within hours of showing signs. In the first six months of 2013, PDSA’s 51 hospitals treated nearly 1,800 cases of suspected parvovirus, but vets fear this may just be the tip of the iceberg so have issued advice for owners, and as more local stories seem to be released by local veterinary practices almost weekly, the situation shows no signs of slowing down. Parvovirus attacks the heart muscle and intestinal tract. Symptoms include vomiting, a foul-smelling diarrhoea that may contain blood, lethargy and loss of appetite, but may not be apparent in older animals. The effects of canine parvovirus are very distressing to witness and it is often fatal. It is particularly serious in puppies as they also risk heart disease from this virus. If your dog starts to vomit or develops diarrhoea then it is crucial to contact your local veterinary practice as soon as possible. Parvovirus is preventable through vaccination, so protecting dogs particularly puppies from disease and suffering should be a priority. I strongly advise owners to ask their vet about vaccinating against this disease and about booster vaccinations throughout a dog’s lifetime. PDSA is warning pet owners in the affected areas and nationwide to be aware that parvovirus continues to pose a threat to dogs. • Signs of parvovirus include vomiting, diarrhoea, blood in the faeces, tiredness and loss of appetite. • If you suspect your dog may have parvovirus, don't take them straight into a vet as this may spread the disease to other unvaccinated dogs and puppies in the waiting room. Instead, keep your pet isolated and call your vet immediately for advice. • Don't 'wait and see' - the main symptoms of parvovirus are severe vomiting and diarrhoea. Dogs suffering from the disease often need intensive care very quickly so don't risk waiting. Phone your vet immediately. • Prevention is better than cure – if your pets aren't vaccinated, book an appointment with your vet today. This will protect them from parvovirus and other diseases such as distemper and leptospirosis in dogs, and leukaemia and feline enteritis in cats. • Once vaccinated, the body's immune system response gradually fades over time, so regular boosters are required to maintain the protection. Ask your vet for advice on when your pet’s boosters are due. Keep up to date with details of the latest regions affected by Parvovirus break outs in the UK on the Parvowatch Facebook group. Can we see all of the actual figures, or the fully referenced scientific paper itself? What percentage of unvaccinated dogs tested positive? What percentage of vaccinated dogs tested positive and what is the explanation for this? Are the vaccines poorly manufactured and ineffective if so where are the refunds? What percentage of vaccinated dogs developed other diseases? Who is funding the studies directly or indirectly? Which “vets” from the PDSA can you name them and confirm whether any of them hold directorships, hold shares or share any other financial interests with the companies that manufacture vaccines? Parvo is a terrible disease. If it can be avoided by vaccination great. But biased stories and a lack of scientific openness will only add to people’s skepticism of an industry that makes millions and has little to no accountability or means of quality control. The information people are getting is not unemotional and fact based but that is what is needed to make a rational decision on whether to purchase a product on the basis that it will be for the long term good. If you could provide hard facts and figures and let people draw their own conclusions without weighted inference it would be much better in the long run. The best situation is one where people are using effective modern medicine for the benefit of their animals. It is absolutely sensible to be skeptical about anything when someone is making money out of it, when they are making ludicrous sums of money with little chance of any backlash a good dose of additional skepticism is required. That skepticism needs to be countered by open and factual explanation and open access to the sources, locations and interests of those carrying out the studies. We can no longer accept assertions that “A group of experts say…” and accept it as fact. History has proven that those who make bland assertions either have a vested interest or have not done enough balanced research to warrant any true scientific conclusion. Taken from the PDSA themselves. Corporations have one legal mandate – to make a profit. They do not “give” unless they expect to reap a return in one form or another – it would in fact be technically illegal for them to do so as unlike unincorporated bodies, they are legally bound to make the maximum return for their shareholders. Thanks for giving us more useful info about Canine parvovirus (CPV) this is a highly infectious disease that can lead to death.Please always Update about this diesease. Dogs do not need to be inoculated yearly in fact it can weaken their immune system. Even some of the drug manufacturers suggest not to inoculate each year. If you do choose to inoculate I would say get the puppy ones done and then every 3 years. I hate it when vets insist on every year boosters. Shameful scare mongering. My friends puppy has been fighting Parvo now for the last 7 days and he too was vaccinated. Where they live in Wales there have been 4 dogs in the last month who have contracted Parvo and all have been vaccinated. Perhaps we should be looking at what some are doing in other countries and having them tested after the 2nd jab and give another 3rd jab when they are 16 weeks old if the test shows no immunity. Apparently a there are a few pups who still have their mothers immunity from birth and this halts the immunity that they should gain from the vaccine. By 16 weeks the mothers immunity is no longer there and the vaccine will then take effect. Or even better, get the drug companies to admit that the vaccine isn’t always working and they need to look at why it’s not working. My 3 puppies contracted this dreadful disease when they were 3 months old following a vist to the vet. I rescued them from a ship as new borns and they had 2 of three vaccinations. One of the sister had a mouth abcess and had to have 5 consecutive day visits to the vet for sntibiotic injection. They put her on the floor and I later discovered they had cases of parvo in there. She started vomitting 5 days later and i rushed her to the vet and was diagnosed with parvo. 5 days and 6 days later the other two sisters developed vomitting. They were all in the hospital fighting for their lives. But my poor little baby that was the last to show symptoms survived 4 days and then i lost her. The other two survived. I had been so careful with them and cared for them from complete newborns. Yet one time they were put on the floor this happens. I see so many people at the vets and elsewhere putting their puppies down! I try and warn them but sometimes i think they think I am being paranoid. But words cannot describe how terrible this disease is. My babies were 14kg and went down to 9kg in 5 days!! they were so weak and ill. Yes I may see that 2 survived but i lost one and that is one too many! My advice to anyone is to PLEASE protect your puppies. Only needs a microscopic infected amount of this virus on your feet the dogs feet or elsewhere and they lick it and that could be your pet fighting for their life!! I have just lost my beautiful little shitzhu called poppy to this horrible disease. I have only had her 10 days. I took her to the pdsa as soon as she was sick. she had had the runs since I got her and I was in touch with the breeder for advice. on 2 consecutive days the pdsa injected her behind her head with fluid because they couldnt get a vein and sent her home. Needless to say she didnt last long after that. i feel they could have done more. Perhaps the pharmaceutical companies need to check their vaccines – it seems strange that vaccinated dogs are getting it and unvaccinated are not always? My poor little innocent puppy recieved the Parvovirus vaccine and 3 days later died from Parvo. A very fast and unfair death. Pet owners are told to vaccinate their puppies, but then we loose them from the vaccine that was to protect them. I’ve had plenty of animals that never recieved the Parvo vaccine, I wouldn’t have any other ones vaccinated, I would just keep them in their own yard away from other pets. It’s so unfortunate for little puppies to loose their lives. And I can’t help blame myself because I was in charge. Once again, I’m sorry for your loss and for every dog lost to this preventable disease.